"What did you think of the Mars landing today?" A crowd of several hundred people chose to spend their midday Monday at Chabot Space & Science Center to witness live-streamed coverage of the landing of NASA's InSight — something they might have done in the comfort of their own homes, as many people likely did. But sharing the tense and thrilling moments of a live landing on another planet in the company of other eager space exploration enthusiasts, of all ages, and on a giant screen, makes for a far more memorable experience. 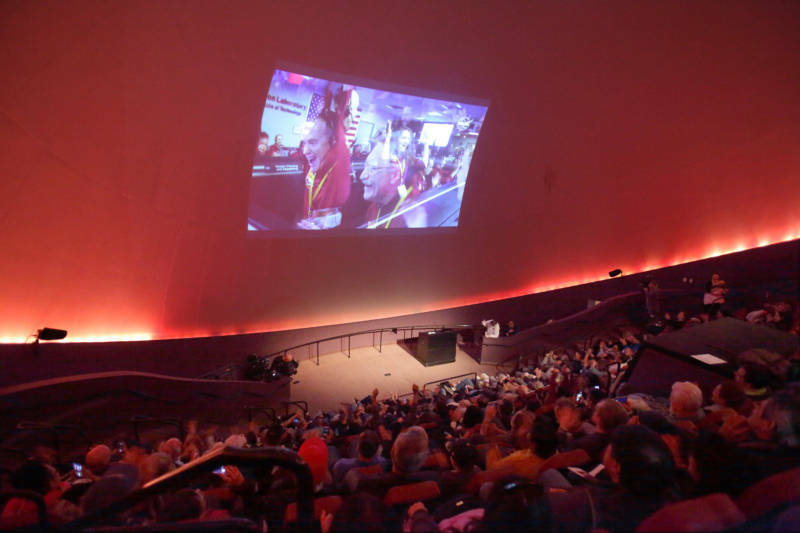 After all, people flock to theaters for midnight premieres of a new blockbuster movie, or fill outdoor stadiums in freezing weather to watch a live sporting event — so it's heartening to witness similar enthusiasm for the live screening of another Mars landing. 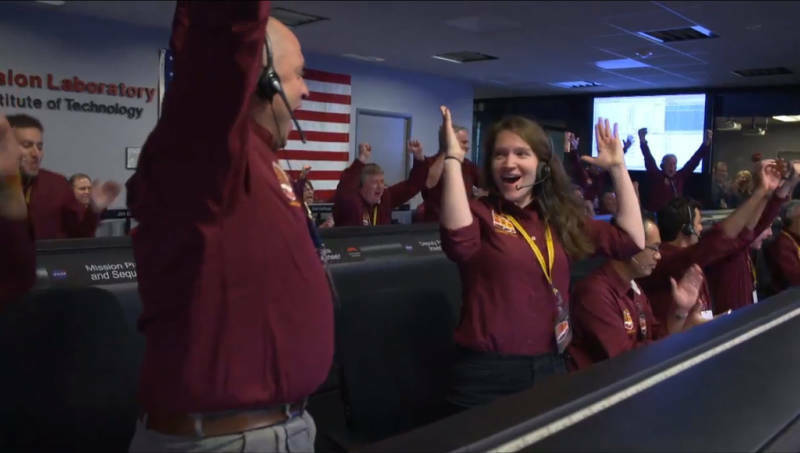 First, there were jubilant cheers when InSight reported a safe planet-fall. You could see the release of pent-up nervous energy in the crew at mission control at the Jet Propulsion Laboratory in Pasadena. It was palpable, as well, to those in the applauding crowd at Chabot. In the days since landing, a collective sigh of relief has been followed by all eyes turning to the mission ahead, and the promise of its rich scientific rewards. Right now, public enthusiasts and mission scientists alike must wait to find out what InSight will reveal of Mars' interior, since it will take at least a few days to carefully plan and deploy the lander's specialized sensors, and probably months to collect enough data to begin telling that story. But after six uneventful months of flight, and six minutes of nail-biting worry, at least NASA and JPL scientists and engineers can now make themselves busy setting up and testing InSight's instruments and other systems. Those of us on the outside will just have to be patient. How did the action go down? 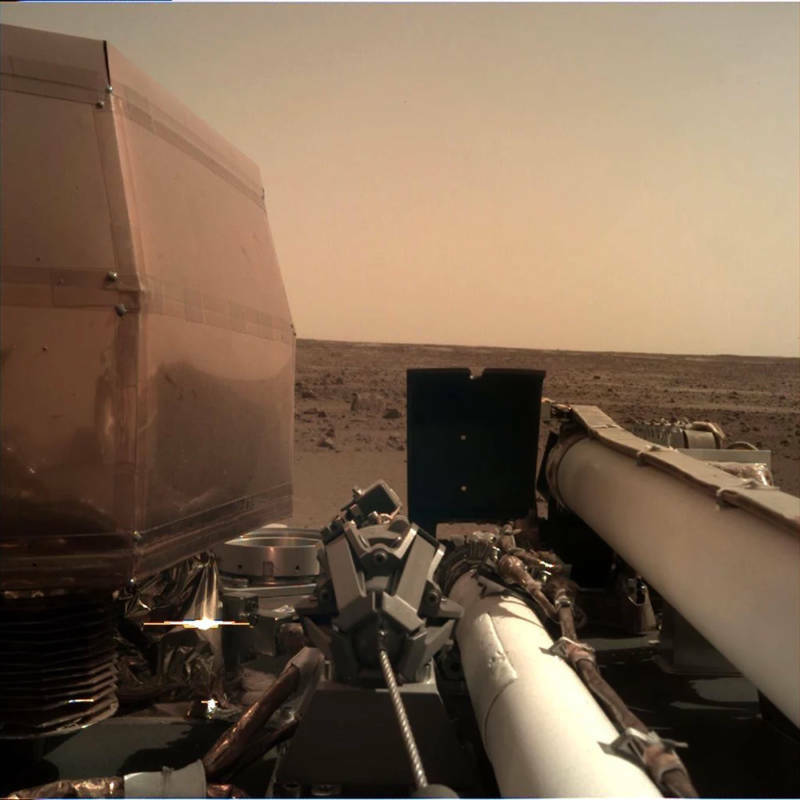 NASA's InSight lander, which has been en route to Mars since launching last May, approached the upper extent of Mars' thin atmosphere on November 26 right on schedule, shortly before noon Pacific Time. Then followed six-and-a-half hushed, tense minutes as a series of critical EDL (Entry, Descent, and Landing) maneuvers were performed by the spacecraft: detachment from interplanetary cruise stage, alignment for atmospheric entry, parachute deployment, heat shield jettison, landing legs extension, radar-ground detection, retrorocket ignition, and…wait for it…touchdown! Meanwhile, mission control operators at the Jet Propulsion Laboratory could only watch as telemetry came in, relayed by the twin MarCO "cubesats" that tagged along to give us a real-time report of InSight's descent. The eight-minute travel delay of radio waves sent from Mars to Earth means that the entire landing sequence would be completed before the radio reports reached mission control. I didn't ask anyone the question: Should we be sending humans, or robots, to explore planets? But it was on one visitor's mind anyway. "You enjoyed the landing?" I asked him. He nodded vigorously. "Should we send more?" "Absolutely," he said. "I don't think that a lot of people appreciate how much we can learn with missions like these, at a fraction of the cost of a mission sending humans anywhere." At $814 million for the total InSight mission cost, on average each American taxpayer paid less than $6. How much does a cappuccino at Starbucks cost these days? Or bridge toll? Or, for that matter, a blockbuster movie at the theater? (Rarely $6 even at matinee prices). Personally, I've always been fascinated by human space voyages — from real ones like the Apollo Moon landings to Star Trek. But I appreciate that we don't need to go to other planets in person to accomplish some amazing feats. We've explored every planet in the solar system, some comets and asteroids, a few moons, and even the fringes of interstellar space, entirely with robots. 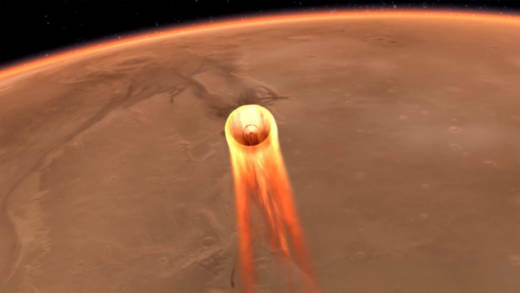 The drama of InSight's landing was not presented through live video or stunning imagery from the spacecraft, as it burned a high-speed trail through the upper atmosphere, or when its parachute gloriously bloomed in the Martian skies above, or as a cloud of rusty dust was raised by the blast of roaring landing rockets. That would be exciting — and may be what a general American movie-watching audience would expect in an epic Mars adventure. But the only visuals offered in a real-world EDL maneuver are pictures of avid, often nervous-looking engineers and scientists sitting tensely before their consoles, their perspiration coldly illuminated by screens full of numbers and graphs. The first few pictures from Mars, taken after landing, arrived on our screens an hour or so later. "I was a little disappointed that we didn't see any pictures from InSight while it was landing; I kind of expected that," said one visitor with a small child in tow. "But it was still very exciting to be here watching when it landed. Definitely worth coming out for." 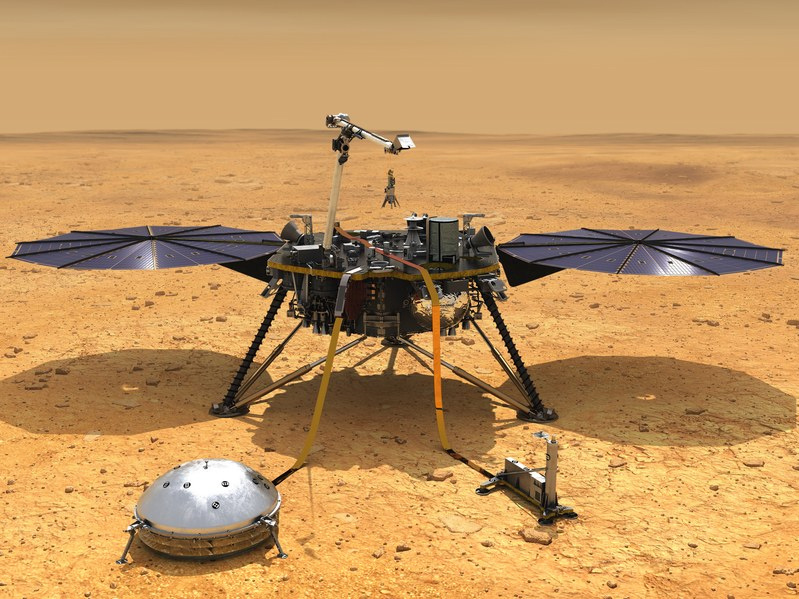 InSight now rests safely on the ground in Elysium Planitia, the vast flat equatorial plain from where the spacecraft will conduct its mission to probe Mars' interior. Every vital step of its landing sequence was pulled off flawlessly — almost an anticlimax to all the possible perilous missteps that could have ended the mission in a heartbeat. Take a deep breath, now. The main adventure is only beginning.